Fiber Flux: Yarn Giveaway! 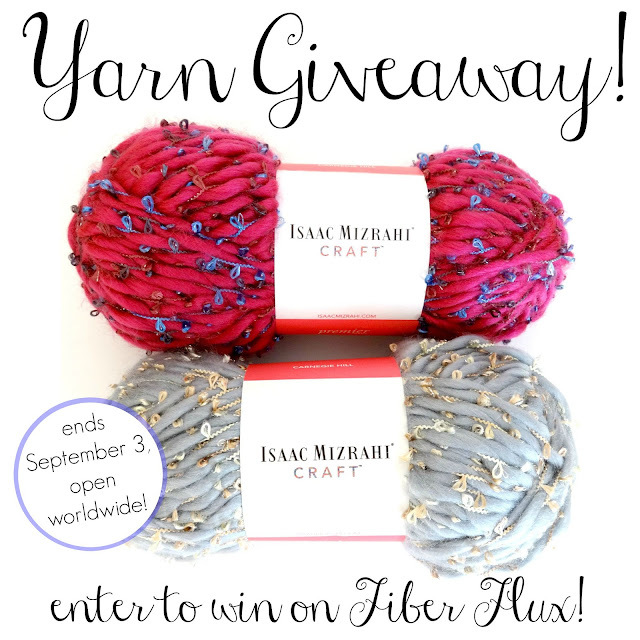 Win 2 Skeins of Issac Mizrahi Craft Yarn! Yarn Giveaway! 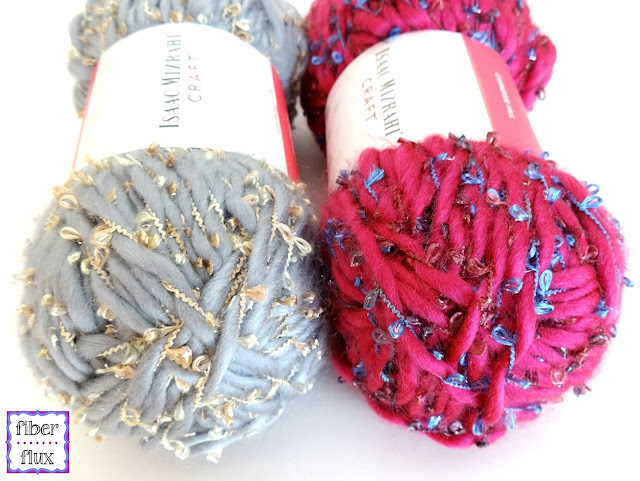 Win 2 Skeins of Issac Mizrahi Craft Yarn! A couple of weeks ago, I designed a free pattern, the Platinum Cowl, made with Issac Mizrahi Craft, Carnegie Hill. So many of you were asking about the yarn and loving it, so I have decided to give TWO skeins of it away! The pattern only takes one skein, so you can make two cowls...one for you and one for a friend! Made by Premiere Yarns, this yarn is artsy and fun to work with. Each skein has approximately 99 yards and comes in seven lovely colors. I picked two absolutely fabulous colors... "Audubon" a soft silver with gold thread spun in, and "Merriweather" a deep pink with a pretty blue metallic spun in. This giveaway has ended, thanks so much for your entries! I would make a beautiful cowl for Christmas presents for my girlfriends:)! Beautiful yarn! I don't know what I would make with it to be honest! Something pretty though! I have used a different brand of the Issac Mizrahi yarn and made a sweater for my sister in law. It was beautiful to work with. I like the idea of making matching cowls for myself and my best friend. It would be an amazing shawl for my girl. I don't know what I could make but it would be fabulous! Such beautiful thread! I have three daughters so I will have to buy another ball. Mahalo for this opportunity. I would make a beautiful hat or scarf of course I'd have to buy more yarn but that's ok, lol! I would definitely make a piece that would stand out and be seen - like a scarf, cowl or shawl. It is fantastic! I would probably make the Platinum Cowl for myself. Cool yarn! I don't crochet nearly as much as I used to, but I'd definitely make a cowl with one of them and then find something else fun ... a winter cap or something, maybe. Yep I would go for the platinum cowl I made some with a different yarn and it would be great to make one with the recommended yarn! I would make a platinum cowl, of course! I don't know what I would make with it but it would be fabulous! I'd make a lovely cowl for my daughter to wear. Would make a beautiful scarf. I would probably make a cowl! I love the glittery bits in it. I would make a cowl with it as well. Definitely a scarf or cowl. This yarn looks like fun to try! Apart from it looking really interesting and pretty it looks really warm, would love a cowl for me out of it, someone else might get the other one if I can bear to part with it. I think I would make a couple of hats. I would make a prayer shawl. I'd make a self indulgent shrug and purchase more of this beautiful yarn. I would make one of your fabulous cowls or infinity scarves! Id use your pattern to attempt the cowl! Thanks! I have been wanting to try this beautiful yarn! Hard to decide what to make but would probably make a scarf. I would make your lovely Platinum Cowl! I'd love to make your newest cowl pattern with this gorgeous yarn. I would make an infinity scarf for the fall! Beautiful yarn. Thanks for the giveaway. I would make a scarf. It is beautiful yarn. If there is enough a shawl would be nice. Beautiful yarn! I would make your cowl pattern for my granddaughters. I have 4 so would have to buy more. I would make cowls with this gorgeous yarn! I think cowls are even more useful than scarves and take up less yarn, so it can go even farther than usual! It would be so great to win this!!!!!!! I would make a cowl. I would have to make cowls! I would make matching hats or cowls for my best friend and I. We've been friends for over 40 years!!! Super pretty yarn! Would love to work with it. Fiber Flux Platinum Cowl with your scrumptious yarn! Awesome yarn! Unsure of what I would make but it would definitely be some type of accent piece. Thanks for the giveaway. I think that this yarn would look good crocheted in a scarf! I haven't made any cowls yet, and you make them so pretty, so I may just have to try that! What would I ms he with this beautiful yarn??? I would make a really cool boho bag. I would definitely make that beautiful cowl! I'd make your cowls, of course. Thanks for the chance to win this gorgeous yarn. I would make a scarf with this gorgeous yarn. I would make a purse. I would just love to try to make a purse with this yarn and find a nice matching fabric to line it. I have been looking for a bulky yarn for this project and this looks just like the right yarn. I would make a cute scarf for my sister's birthday. I would make a cowl or scarf for my daughter. I would like to make a shawl or maybe some fingerless gloves. Thanks for the chance to win. i think i would make my daughter a slouchy hat! I'm working on the platinum cowl. Your video sure helps!! I would make the Platinum Cowl , one for each daughter! I found your blog while searching for free crochet cowl patterns, and I am in crochet heaven! Beautiful work and so many awesome tutorials your site is fabulous. I went straight to Michael's on Friday and got an N and P hook, made the Marshmallow Cowl this weekend, while I was there I saw the Isaac yarn in person it's so pretty in person. Beautiful yarn for a beautiful capelet!!! Darlene P.
Something for myself! Scarf/cowl, I think. Or I'd buy more & make a sweater/shrug! I would make two cowls for Christmas presents. I would make an evening bag for the winter. The sparkle and thickness would be a real conversation piece with any evening attire. My sister knits and crochets faster and neater than I do so I'd ask her to make me the lovely cowl for Christmas. I would like to win this to give to a friend, no idea what she would make with it because I can't ask her for obvious reasons!